ONE in three primary school children now have their own mobile and kids as young as eight are carrying smartphones. The sharp increase in mobile phone ownership amongst children has resulted in cyber safety experts calling for parents to ditch smart phones for "dumb phones''. New research by the Australian Communications and Media Authority - obtained exclusively by News Limited - shows 35 per cent of children aged eight to 11 now owns a mobile phone, a figure which has almost doubled since 2007. 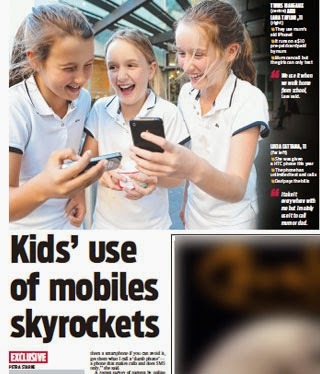 "Kids' use of mobiles skyrockets", Daily Telegraph, April 27, 2013. Click here to read this story online.